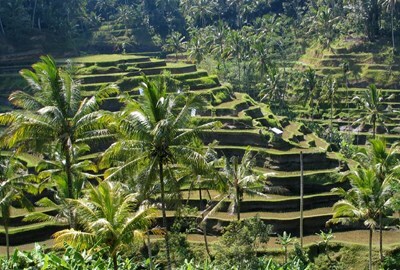 Subak is the name of water management (irrigation) system for paddy fields on Bali island. For Balinese, irrigation is not simply providing water for the plant's roots, but water is used to construct a complex, pulsed artificial ecosystem. Paddy fields in Bali were built around water temples and the allocation of water is made by a priest. Subak had been described by Clifford Geertz, but it was J. Stephen Lansing who drew attention to the importance of the traditional system. This description uses material from the Wikipedia article on Subak (irrigation) and is licensed under the Creative Commons Attribution-ShareAlike License (view authors).